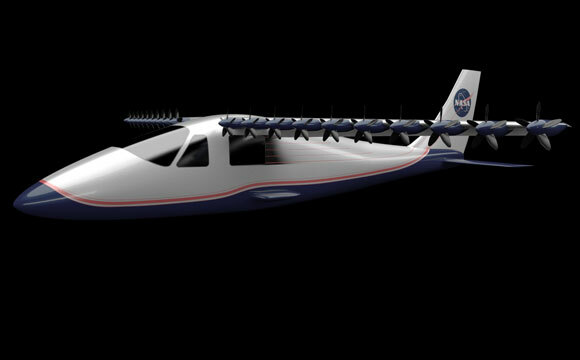 NASA scientists believe distributed electric propulsion is set to usher in a new era of aviation, allowing engineers to do things that they have wanted to do for 50 years. Mark Moore imagines a world where clean, agile airplanes conquer highway gridlock, where soul-sapping, two-hour commutes are replaced with a quick leap through the sky. What aviation advance could make such a world possible? A potentially revolutionary concept with a mundane-sounding name: distributed electric propulsion. Ultra-efficient, lightweight electric motors, and improvements in battery technology and autonomy will combine to create a new golden age of aviation innovation, Moore predicts. For 30 years, Moore has designed advanced aircraft concepts for NASA, concentrating mainly on smaller vehicles. At NASA Langley, he’s now developing the Convergent Electric Propulsion Technology X-Plane. Through that project and others, NASA researchers are learning how to harness the freedom that electric propulsion brings, Moore said. One of electric propulsion’s charms is the ability to work on almost any scale. “Whatever size those electric motors are … you get high efficiency, high reliability and incredible compactness,” he said. “Whether it’s at one horsepower, 10 horsepower, 100 horsepower or 1,000 horsepower, those characteristics stay true. It doesn’t care how big or small the motors are.” That’s not the case for existing internal combustion or turbine engines. Size flexibility allows designers to position propellers in places on the aircraft not possible before, with the goal of creating a more agile, capable aircraft. Because they’re electric, the motors can be controlled digitally to work in close harmony with other aircraft systems. Adding autonomous control would make new capabilities possible. “Distributed electric propulsion lets us do things that we’ve wanted to do for 50 years,” Moore said in an interview before his talk. For example, many experiments with what’s called Vertical Take Off and Landing, or VTOL, have met with lackluster results. Designing an aircraft that can take off like a helicopter, and then fly forward with wings like an airplane, is difficult, Moore said. Electric propulsion makes new, promising VTOL aircraft designs not only possible, but feasible for use in civil transportation. Those designs come with the added benefit of being environmentally friendly in terms of fuel consumption and noise. Already, these ideas have jumped from the drawing board and onto the runway. Earlier this year, researchers from NASA Langley tested a remotely piloted prototype called the Greased Lightning GL-10. Greased Lightning — with a 10-foot wingspan and 10 electric, battery-powered rotors — successfully transitioned from hover to wing-borne forward flight during tests at Fort A.P. Hill in Virginia. A YouTube video documenting that flight has been viewed more than a million times. Moore’s own project is SCEPTOR, which stands for Scalable Convergent Electric Propulsion Technology Operations Research. Teams from NASA Langley and NASA Armstrong Flight Research Center have partnered with California companies Empirical Systems Aerospace and Joby Aviation to push electric propulsion concepts forward as quickly as possible. 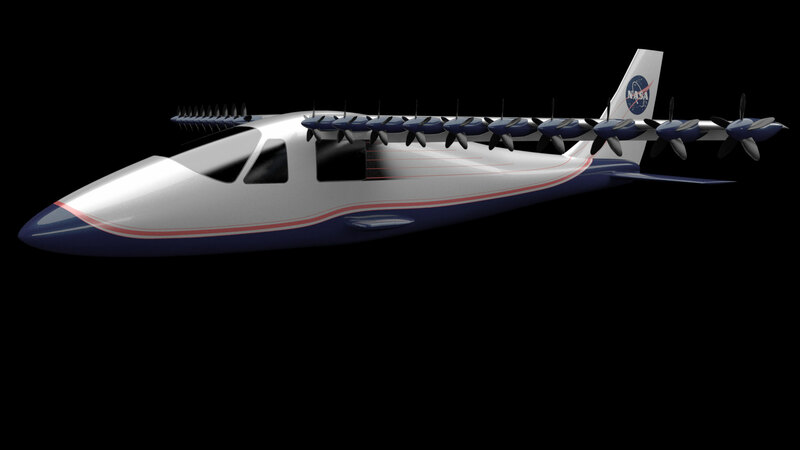 NASA and its commercial partners are adapting a standard model private aircraft, the Tecnam P2006T, to be powered by multiple electric propellers spread across its wings. The project, costing $15 million over three years, is intended to show how the new propulsion system changes what an airplane can do. “We can do exact comparisons to see what this technology is giving us,” Moore said. The project aims to prove that operating the electric version of the Tecnam requires three- to five-times less energy during the high-speed cruise portion of a flight. The goal is to produce an aircraft concept that will be pounced upon by industry and embraced by early adopters. Success in the private airplane market would pave the way for the technology to be expanded to bigger, commercial commuter aircraft. Once the concept is proven, Moore believes airlines could put electric propulsion to work for their shorter, commuter routes within four years. The promise of lower operating costs would encourage the switch. Range remains an issue with the new technology. Current batteries would allow an electric plane to fly about 230 miles (370 kilometers). Whether it’s through a small unmanned aerial vehicle delivering a package, or an electrically powered commuter aircraft that’s cheaper, more reliable and easier to land in an environment close to homes and businesses, on-demand mobility has the potential to change society for the better, he said. And he’s not worried that gridlock on the highways will someday be replaced by gridlock in the skies. Moore believes the future of flight has arrived on the front porch and it’s knocking. 2 Comments on "Distributed Electric Propulsion May Usher in a New Era of Flight"